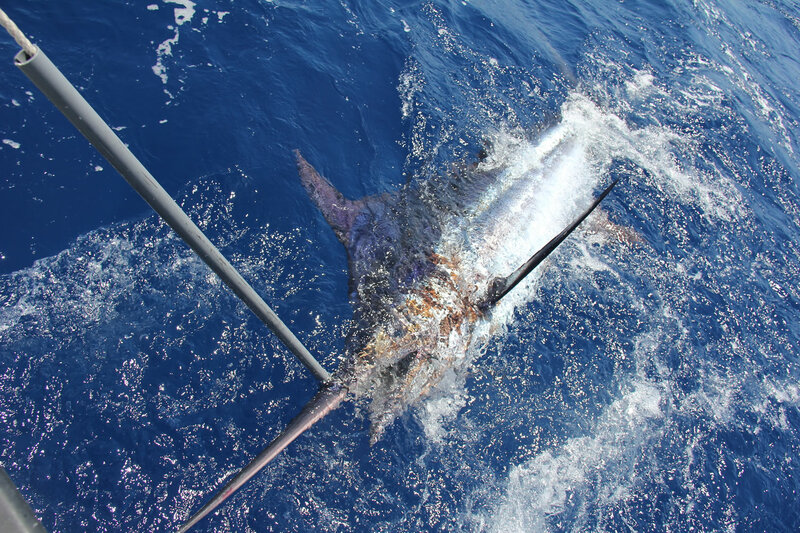 For a unique Tuna fishing experience, the Island of Madeira is the perfect location as it offers a bewildering choice of different fishing grounds in ideal environments, mainly due to the beneficial climatic conditions which prevail in this region. Almost all year round it is mild and warm, and on the south western coast of Madeira the Tuna fishing grounds are well protected from any harsh winds or unfavourable weather conditions. For passionate fishermen the opportunities to catch big game fish are sheer endless with Madeiran fishing boat crews making every effort to cater for all needs. Both fishing amateurs and professionals will discover that trying to catch some of the biggest tuna fish which can be found in these crystal clear blue waters is indeed an irresistible challenge. So why not deciding to give it a go and head for perhaps the once in a lifetime Tuna fishing experience? Boat charter Tuna fishing with the “Dream Catcher”, a robust American saltwater fishing boat (Rampage 31), built in 1988, which is well equipped with excellent fishing tackle and electronic fishfinder, a Raymarine GPS and Shimano and Penn reels, always on the lookout for the really giant tuna fish. Travel speed: 30 knots. Tuna species such as the Atlantic Bluefin Tuna, the Yellowfin Tuna, the Albacore Tuna or the Big Eye Tuna can be found in great numbers, with the up to 700 pound heavy Bluefin Tuna presenting an absolute triumph even for the most experienced fishermen, whereas the Yellowfin Tuna and the Big Eye Tuna frequently surpass the 200 pounds weight mark. Very often traditional fishing equipment such as fishing rods, pole and line is used in order to secure spectacular fishing results. 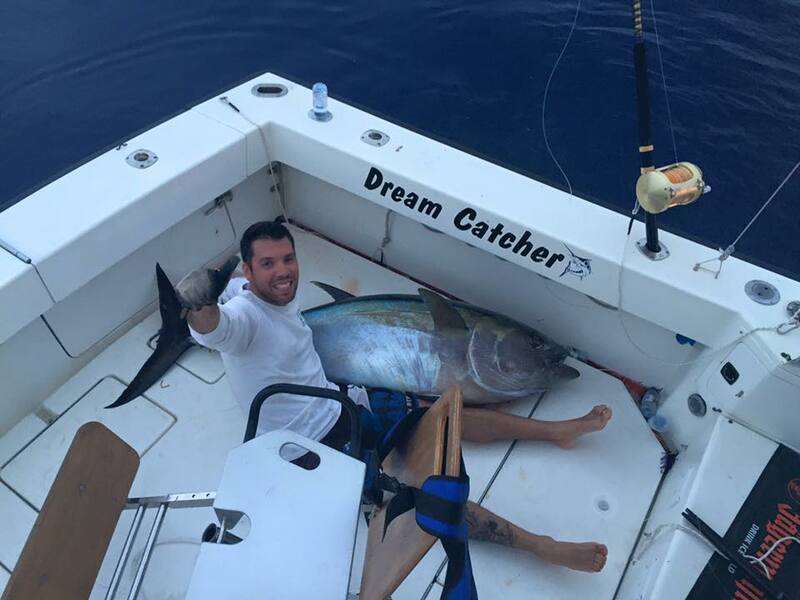 In Madeira the extremely popular “Dream Catcher” boat charter Tuna fishing trip can be booked according to individual preferences. Charters can range in price from 700 Euros for half day charter (minimum 4 hours fishing time) to 5-day charters from 1100 Euros per day, while the charter fee can equally be split among other participants on the fishing tour. 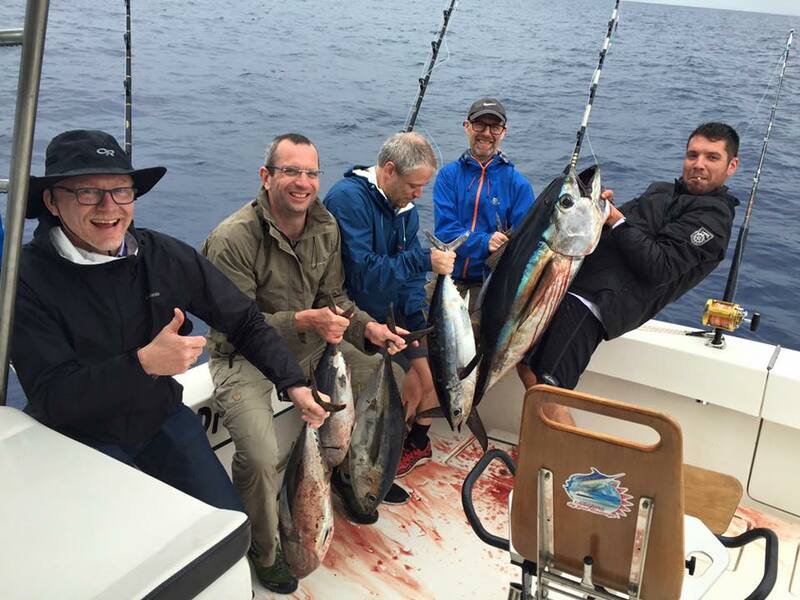 The full day fishing tour is offered for 1200 Euro and offers at least 7 hours of fishing for tuna. Fishing licenses are provided for all passengers on board the “Dream Catcher”, with no additional charges for refreshments and light food. Life baits, rods, reels and tackle as well as catch cleaning and filleting are also included in the price. Wheelchair access for people with special needs. Kite fishing or trolling are regular techniques while using natural or artificial baits. For Nearshore fishing (Bigeye Tuna, Skipjack Tuna) Light tackle, Bottom Fishing, Spinning and Popping are the fishing techniques applied on the “Dream Catcher”, while for offshore fishing (Tuna Albacore, Tuna Bluefin) fishing methods include Drift Fishing, Trolling, Jigging and Heavy Tackle. Best fishing time for Bluefin Tuna is October and November, and there are great fishing opportunities for the Tuna Albacore during the long season from February to November, though some surprising catches can be made during off season, too. Due to the fact that it is greatly valued as a fine delicacy, the Big Eye Tuna is the most important Tuna for the local fishery.